Would you take your side projects more seriously if you found out someone would pay you tens of thousands for it? Side projects are much more than simply hobbies, they are indicators of what you are capable of building. In an age where so many people are talkers and so few are doers, side projects can be the factor that sets you apart from the rest of the pack. More importantly, side projects are not creatively stifled by the ordinary campaigns or work-related projects that you have to endure through. You can explore any of your curiosities, and that freedom is the elixir behind the effectiveness of the side project. Companies that have taken advantage of the power of side projects have found it to pay dividends. A famous example was Google’s 20% time; for those unfamiliar, Google allowed employees to spend 20% of their time on a fun side project they were passionate about. It was through this 20% time that some of Google’s most important products, such as Gmail, Google News, and AdSense came about. Social network StumbleUpon has over 30 million users and 100,000 advertisers. It was previously acquired by eBay for $75 million. This gigantic social network was started by Garrett and a handful of his peers from the University of Calgary in 2001 as a Firefox extension. Later on, while he was CEO of StumbleUpon, Garrett would be compelled enough by another idea to start working on it as a side project. As Uber co-founder Travis Kalanick explains in this blog post, Garrett brought up the idea of solving the taxi problem in San Francisco by introducing a limo timeshare service. This happened while the two of them were at a conference in Paris in late 2008. 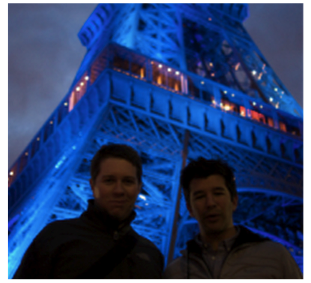 Uber’s founders in Paris. Image Source: NetConcierge. Today, Uber has 300 employees, raised $200 million in a funding round led by Google, and been valuated at $3.5 billion. Now one of the world’s fastest growing companies, Uber would not have existed were it not for Garrett’s curiosity and passion for side projects. After listening to her father’s suggestion to write these stories down, Gaby essentially created and self-published her own column, titled 100 Interviews. Using 100 Interviews as a portfolio, Gaby landed a series of freelance opportunities much more related to journalism, including one at The New York Times Magazine. 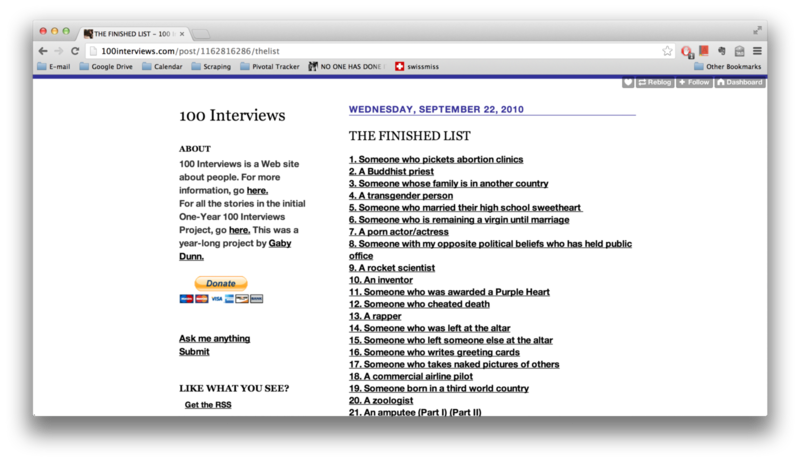 The original list of 100 interviews. Click here to see the whole thing. While 100 Interviews isn’t a completely unheard of concept, it was a remarkable side project that landed Gaby the journalism opportunities previously unavailable to her (in addition to some awesome memories and experiences). It ended up winning an award from Village Voice for Best Tumblr. 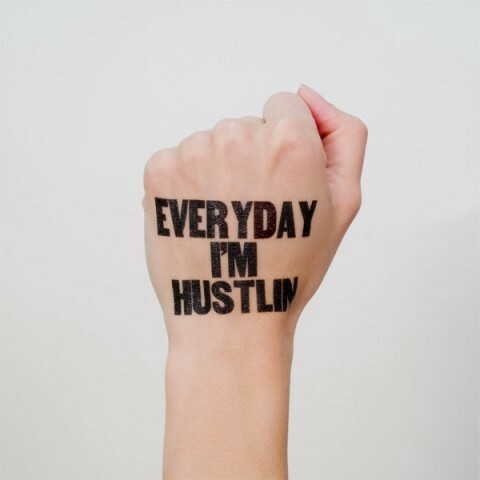 Everyday I’m Hustlin Tattly temporary tattoo. While Tina was applying a particularly ugly temporary tattoo to her daughter, she figured there had to be better looking tattoos out there. After completing the process, Tina got in touch with a couple of artists and asked if they would be interested in submitting concepts for temporary tattoos. In a couple of days, Tina was bombarded with submissions from many other artists, and she decided to create a side project that would share high-quality tattoos with the world. Tattly was born, and would go on to win the Shopify New Business competition. Tattly now has a team of 10. Whenever Tina notices a problem, she launches side projects to tackle it. While she was at a conference, Tina realized that while conferences were extremely exciting, they were temporary and would not nurture the community. She created Creative Mornings, a monthly gathering of the creative community, in order to build a lasting community that would develop in New York City. Eventually, the Creative Mornings caught on with her friends in various parts of the world, and there are now chapters internationally. Tina’s Studiomates co-working space, home to many side-projects. Studiomates spawned out of her dislike of working at home and her observation that most co-working spaces were centric on money (as opposed to talent). Tina rented a space and grew from 4 “tenants” to 30. Studiomates has hosted some fascinating individuals, including the creators of products such as Quarterly, A Book Apart, and Brain Pickings. This community would go on to appear in The New York Times. TeuxDeux was a side project born out of a lunch Tina had with other creatives in Studiomates. Tina noticed that few to-do list solutions function the way she’d like them to, and most lacked aesthetic appeal. She drafted up the wireframes and designs for the side project that would become TeuxDeux, and a developer who worked at Studiomates coded it. TeuxDeux, Studiomates, and Tattly all enable Tina to generate multiple streams of income through fun side projects. (Creative Mornings is a completely volunteer-driven operation.) It seems as though Tina has an instinct, and even an impulse, for side projects; she even started a Tumblr for whenever her son throws silent tantrums and lies down in protest. It’s financially rewarding, it can open up doors for your career, and it is the safest ground for you to experiment in. One final example: Kevin Systrom was doing marketing at Nextstop as his day job. Systrom (without formal computer-science training), would spend his nights and weekends building side projects to learn how to code. Eventually, he came up with a location-based product named Burbn. While this initial prototype didn’t take off, users loved the photo-sharing features in the product. Systrom and his co-founder would spin this feature off into its own app, named Instagram. Instagram was acquired by Facebook in September of 2012 for $1 billion. According to The Next Web, it now has over 150 million users. Start something. It could change your life. Inspiration is a fuel, a temporary ability to do tough things. Companies like Facebook, Google, and Shopify renew their inspiration by using our art products. Get busy building things. 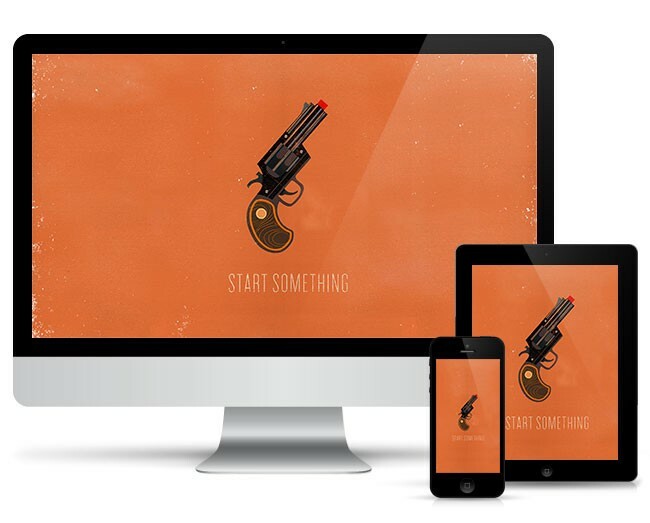 Download the Start Something Wallpaper. Like the ‘Start Something’ image? Download a free high-resolution version of Start Something for your phone, tablet, or computer. This post was written by Herbert Lui and edited by Robleh Jama. A collection of inspirational writing.